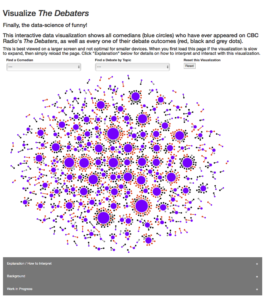 The Debaters viz is an interactive D3 force-layout data visualization. It lets you see all debate outcomes and all comedians who have ever performed on the CBC Radio program The Debaters, over its 12 year history. Vividdata Visualization made it to discuss principles in observing magnitudes and variabilities, which is part of a larger conversation about designing visualizations to communicate messages effectively. Check it out if you want to start thinking about data visualization as a communication technology, or even if just to explore a whole lot of funny.